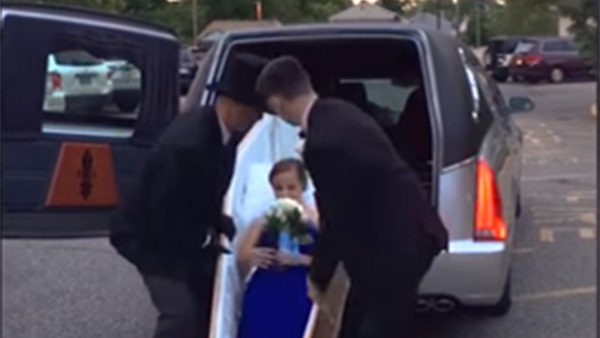 A New Jersey high school student who hopes to become a funeral director has surprised her classmates by arriving at her prom in an open prop coffin. Megan Flaherty says she mainly wanted to have fun while attending Pennsauken High School's junior prom Saturday. The 17-year-old says she checked with her date to make sure he had no reservations about her plans. Flaherty's open coffin slid out of the back a hearse. She then stepped out of the coffin on the hand of her date and smiled as other prom goers looked on in amazement.